Boiling eggs seems like it should be so easy, but it’s often not! Sometimes the yolk turns out too hard, sometimes too soft, and sometimes it even bursts open when cooking. Don’t worry, Utopia will help you make the perfect egg. Four minutes: The egg white is firm, but the egg yolk is still very runny – a perfect breakfast egg. Seven minutes: The egg yolk is thickening – now you have a snack egg. 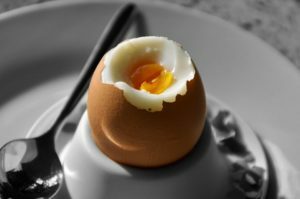 Eleven minutes: The egg yolk is firm and can be cut with a knife – a typical hard boil egg. If you use smaller eggs, you have to cook about 30 seconds shorter, for larger eggs 30 seconds longer. The size of the eggs – larger eggs take longer than smaller eggs. The temperature of the eggs – direct from the fridge, eggs need to cook up to one minute longer than if they began at room temperature. Your altitude – most of us cook eggs in boiling water that has begun to bubble. That is about 100°C (212°F) at sea level, but only 90°C (194°F) at 3.000m (10,000 ft). The higher your elevation, the longer the egg has to cook. The egg white begins to thicken at 62°C (143°F). By the time it reaches 63°C (145°F), the egg white is no longer runny; a solid egg white with a liquid yolk is hard to beat! At about 66°C (151°F), the egg yolk is soft like wax, and at 70°C (158°F) the yolk is firm and can be cut with a knife. You can envision it now: happy hens, pecking at the ground, enjoying carefree dust baths in the sun before wandering into a lush green meadow to lay your breakfast eggs. Sadly, it is often nothing like that at all. To spare chickens unnecessary suffering, Utopia advises buying free-range organic eggs. 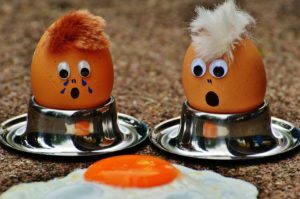 Looking to reduce your egg consumption? For many recipes there are vegan alternatives – just give it a try!